Many, many years ago, the only way for caravans with goods and pilgrims to reach the Rila Monastery was a narrow mountain path that crossed the mountain. This path passed through Kirilova meadow, reached the Dry Lake, continued to „Kobilino branishte” (a col in the mountain) and reached Malyovitsa hut and the peak of the same name. From there it went down all the way to the valley of the Beli Iskar River. Nowadays the path still exists, but instead of pilgrims and caravans it is filled with tourists who want at least for a day to escape from their busy everyday life and to enjoy the magic of Rila Mountain. If you like to explore the mountain and you are looking for an interesting route for a one-day walk, we offer you to test your strength on one of the most popular tourist routes that starts from Kirilova meadow and reaches to the Dry Lake. Where is the lake located and why is called that way? The Dry Lakes is one of the lowest located lakes in Rila. It is situated at an altitude of 1892 meters and covers an area of about 200 meters in length and 120 meters in width (the width and length vary depending on whether the lake is high-water or not). The lake is glacial, endorheic and is fed by the melting snow and by two small streams that come from the nearby „Kobilino branishte” and „Popovokapskite Lakes”. As it is mainly fed by the melting snows, during summer season the lake often becomes dry and therefore is called „ the Dry Lake”. This route is also called the Botanical Route as it passes not only through incredibly beautiful places but on the way you can enjoy a large number of botanical species that can be seen only in Rila Mountain. Throughout the route and around the Dry Lake you can see Rila rhubard, Rila cowslip, Anchusa davidovii, wild onion, Rila lily, Rila violet and more. How to get to the beginning of the route? We mentioned that the tourist trail starts from Kirilova meadow, but before that you have to reach the Rila Monastery. Once you reach the gates of the monastery, you have two options – either first to see the monastery and then go to the Dry Lake or leave the exploration of the cloister for last. Our advice is to choose the second option, because you will need at least a few hours to see the whole monastery. The better option is to postpone the exploration of the cloister and first to see the Dry Lake, in order to have enough time to explore the monastery without being pressured by time. The path that you have to take to Kirilova meadow (the starting point of the tourist route to the Dry Lake) starts behind the monastery and passes by the cave where Ivan Rilski lived as a hermit. He gave everything that he had and went to the „Saint Dimitar” Monastery, where he became a monk. 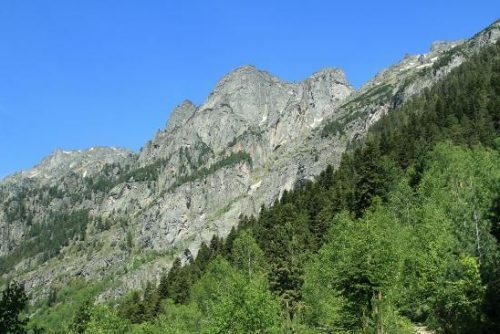 His connection with nature and his unwillingness to live in the material world, made him dedicate his life to a hermit so he settled in a cave in Rila Mountain. The entire life of Ivan Rilski was dedicated to help the sick and poor people and he made many miracles. His deeds made him very famous during his life, but the saint didn’t give up of his life of a hermit to the last day of his life. 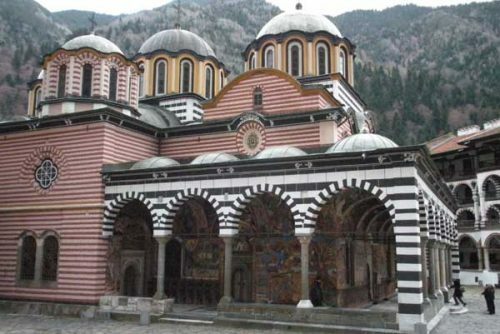 Everyone who reaches the Rila Monastery, must spend a little of his time to visit the cave of Ivan Rilski. Our advice is not to miss the chance to visit it and honor the life and work of one of the most significant people in the entire Bulgarian history. After this little detour you have to continue on your way and very soon you will reach the Bachkova cheshma area, and once you get there you have to follow the marking that indicates the road to Kirilova meadow. The path to the meadow is very pleasant and easy, and on your way you can enjoy not only the beautiful views to the peaks of Rila Mountain, but also you can stop and see the churches „The veil of the virgin”(Pokrov Bogorodichen) and „Saint Luke”. You can also get to Kirilova meadow area on the asphalt road that is quite comfortable during dry weather. The path starts behind the Rila Monastery and leads directly to the area. Kirilova meadow (1500 meters) is an exceptionally beautiful area from which start other beautiful routes such as Kirilova meadow – Ribni Lakes – Smradlivoto Lake, routes to the nearby huts „Granchar”, „Malyovitsa” and others, but we won’t introduce you to them now, so we continue to the Dry Lake. Once you reach the meadow you have to look for a white-green-white marking and follow it. The path passes through a beech forest and in about half an hour walking in a relatively easy terrain, you will reach the Karkolitsite area. An extreme climbing expects you here but once you reach the highest point of Karkulitsite, you will forget all difficulties that you had. We are sure about that because the view, which is revealed from there to the Rila Monastery and the surrounding peaks, is magnificent. After you pass through Karkolitsite, the path continues through a pine forest and green meadows and very soon you will reach the next (and last) small hill. Then you only have to go downhill to the valley of the Dry Lake. Once you reach the valley, there is only a little bit more walking until the final destination and you can be proud of yourself. All you have to do is enjoy the beauty of the lake, which almost all year round is surrounded by beautiful forest flowers. Make a nice break, have a picnic and enjoy the views that are really amazing. 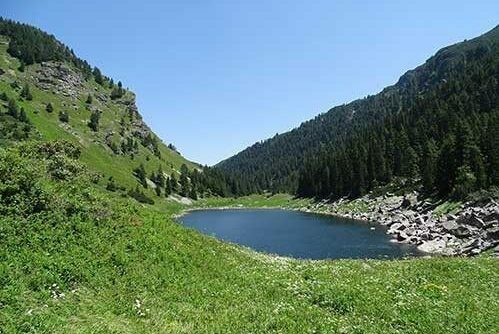 And if you are lucky, you can see in the meadows around the lake some of the rare botanical species that grow only in Rila, as this is the reason why this route is also called the Botanical route. The time you will need to pass the entire route from Kirilova meadow to the Dry Lake is about 2 hours (at normal speed) and an hour and 45 minutes (at a steady pace). The displacement that you have to overcome during the trip is about 400 – 500 meters. The passage is of medium difficulty and you can walk it also with kids. If you have enough energy (and desire) you can continue the walk to „Kobilino branishte”, as from there you can follow the marked trails and reach the Ribni Lakes, Malyovitsa, Govedartsi, Borovets and more. If the route Kirilova meadow – the Dry Lake was enough for a one-day walk in Rila Mountain, you just have to go back following the same route downhill to the Rila Monastery and then you can explore it in details. No matter how many times you have visited the Rila Monastery, the holy cloister has something more to surprise you with. There is always more to see, there is always something that you have missed to see the previous time or the time wasn’t enough. And we sincerely envy those of you who still haven’t visited the Rila Monastery, because the first impression of the biggest monastery complex in the country is something that cannot be forgotten. The monastery was founded by the greatest Bulgarian saint Ivan Rilski in order to accommodate there some of his students. The cloister was situated a little further in the mountain and it was small and modest. The initial building process on the current location of the monastery started approximately in 1335. During that time was built the Hrelyova tower (which you can see today), as well as some of the residential buildings of the monastery. The monastery cloister is a treasure that preserves in itself parts of the Bulgarian history and our Christian faith. This is the place where everyone feels peace, calmness and silence, which reach every single part of our being. How to get from the town of Bansko to the Dry Lake? If you are on a holiday in the town of Bansko and you decide to make a trip to the Dry Lake, then from Bansko you have to go in the direction of the Rila Monastery. The distance from the resort town to the monastery is 94 kilometers and in order to get there you will need about an hour and a half. If you decide to walk all the way, then you have to leave your car in the parking lot in front of the monastery and follow the path that starts behind it, the same path that we described above. But if you want to make a shortcut, you can continue walking on the asphalt road behind the monastery, which will lead you directly to the Kirilova meadow area and from there you can start the passage to the Dry Lake. Whichever option you choose, you won’t regret that you have spent one day of your vacation to enjoy the beauty of Rila Mountain. If the walk to the Dry Lake seems short to you and you decide to continue to the „Kobilino branishte” shelter and to Malyovitsa hut, then you can spend the night in the hut and on the next day you can go back. There is another option, you can spend the night in the monastery cloister, so you will be able to explore it in details and rest after the walk.